Nilambur recorded the highest rains in the history of the state in 24 hours. Nilambur in Malappuram district has received rainfall of 398 millimetre as against the 321.6 mm recorded at Mananthawady in Wayanad district in 1941 considered as the highest in the history of the state in 24 hours. The rains started from Wednesday morning 8.30 to Thursday morning 8.30 totaled 398 mm in Nilambur. Hundreds of families are stranded in Mananthavady taluk as water-level increased after shutters of Banasura Sagar reservoir opened. A Navy team with five boats reached Wayanad from Kochi for rescue operations. Two helicopters of Navy and a team of National Disaster Response Force (NDRF) also have started rescue operations in Mananthavady. The district received 398.71 mm rain in the last two days, district collector A.R. Ajayakumar said. He also warned people to keep off from travelling through Ghat roads during odd hours and those living close to rivers and lower reaches of dams should be alert during the night. Though restricted, the vehicular movement reinstated through all the Ghat roads for light vehicles by noon on Thursday. In the Thamarassery Ghats, a landslip at 9th hairpin bent resulted in the roadblock. The Beechanahalli Dam in Karnataka was opened allowing 71.100 cubic feet water per second as the flow in the reservoir increased after lifting shutters of Banasura Sagar Dam. Rijith, 25, son of Parappanpara Madhavi, was killed at Mathikunnu near Puduppadi in Kozhikode when he was trying to save his car from the flash flood. However, his friends managed to escape while the car got trapped in the running water. His body was recovered from Vallyad by 11 30 am. The mishap occurred when a river got diverted which ran through a road with houses on both sides. Two were killed when flash floods hit a house at Ayyankunnu on Thursday. 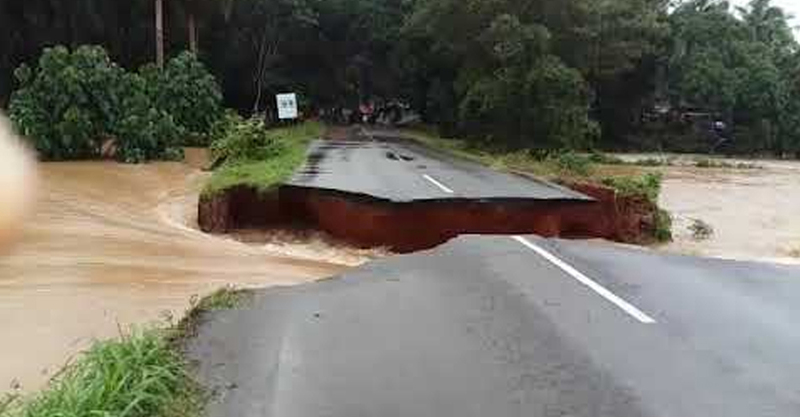 Two persons were killed in Kannur district on Wednesday in landslide-triggered flash floods.